 New Mexico Programs of Study helps to educate high school students and their parents about postsecondary education and career services. We want to connect students with the technical education they’re looking for while in high school so they can graduate ready to enter the workforce or finish their industry credentials, associate degree, or bachelor degree. Students who participate in dual credit programs are more likely to finish their degree, so it’s important to start now. And we want to make it easy to find a program that fits students’ needs. Our search tool will help identify the partnerships between colleges and high schools in the state and the programs available as a result of those partnerships. Start your search today. Programs of Study are developed at different rates within each school district and are subject to change. Therefore, we cannot guarantee course availability. Contact your counselor for details. New Mexico schools do not discriminate on the basis of race, color, national origin, gender, age, or disability. Funded by a Non-Traditional Participation Grant through Eastern New Mexico University Roswell and the New Mexico Public Education Department College and Career Readiness Bureau.